We are happy to announce that a new build for Trial Edition of uniGUI is available. It contains many bug fixes, new features and improvements. It can be downloaded from here. [UNG-1965] - UniTreeNode: GetPrev and GetPrevSibling methods. [UNG-1969] - TUniFormattedNumberEdit: Ability to set FormattedInput parameters at runtime. [UNG-1991] - New TUniLibraryFileOption set "upoDefer" member. [UNG-1998] - TUniTreeNode: New TopItem property. [UNG-1999] - TUniTrackBar: New LineSize property. [UNG-2000] - TUniTrackBar: New UseTips property. [UNG-2003] - Prevent calling unsafe methods ProcessMessages & HandleMessages in DLL mode. [UNG-2004] - Prevent calling unsafe methods AllocateHWnd & DeallocateHWnd in DLL mode. [UNG-2012] - Support for full links in ServerModule.CustomFiles. [UNG-2020] - DBLookup controls: New ListFecthAll property. [UNG-2035] - TUniTreeView: New ShowIcon property. [UNG-2040] - UniServerModule: New PatchVCL option. [UNG-2056] - Application Icon creation logic changed. [UNG-2065] - UniDBGrid: Allow editor in memo field. [UNG-2072] - UniNativeImageList: Improved IDE design editor. [UNG-2083] - All DBGrids: New EmptyText property. [UNG-2095] - TUniControl: New JSId property. [UNG-2096] - TUniFormControl: New FormControlJSId Property. [UNG-1955] - Fix all compile warning messages. [UNG-2059] - Sessions must be freed before ServerModule.OnDestroy event. [UNG-1973] - New methods: ShowMessageN & ShowModalN. [UNG-1996] - TUniChart: New SaveImage method. [UNG-2001] - TUniCalendarDialog: New Execute (Blocking) function and ExecuteN methods. [UNG-2015] - TUniDBGrid: New dgColumnMove option. [UNG-2023] - UniServerModule: New soWipeShadowSessions option. [UNG-2052] - Functions uniGUIApplication.FmtSettings and uniGUIApplication.PFmtSettings. [UNG-2060] - ServerModule: New OnBeforeShutdown event. [UNG-2080] - ServerModule: New soControlNameAsId option. [UNG-2094] - TUniStringGrid: New Objects property. [UNG-1956] - Bug when login background image is blank. [UNG-1958] - Unnecessary lock is performed when processing requests. [UNG-1959] - Design time Font.Style is wrong when ParentFont is false. [UNG-1961] - UniNumberEdit: OnChangeValue is not called. [UNG-1964] - UniTreeNode: AbsoluteIndex returns wrong value. [UNG-1966] - CoInitialize is not called in worker thread. [UNG-1967] - UniTabControl: Tabs.AddObject doesn't create new tab. [UNG-1968] - UniTabControl: Tabs.Insert() doesn't insert tab at correct postion. [UNG-1970] - Stored cookies are cleared if a new cookie is set at session startup. [UNG-1972] - Broken MessageDlg functionality. [UNG-1974] - Issue when a non-RTL control is inside a RTL parent. [UNG-1979] - Issue when editor KeyUp event has a handler. [UNG-1985] - Issue when ComboBox items contain trailing spaces. [UNG-1997] - Inherited grid wrongly saves properties in DFM file. [UNG-2011] - TUniTreeView: Change event is executed in wrong order. [UNG-2019] - UniCharInSet(): Char is casted to AnsiChar causing unicode chars to truncate. [UNG-2021] - TUniEdit: FormattedEdit: DecimalSeparator & DecimalPrecision can't be changed at runtime. [UNG-2022] - In OnSessionTimeout event timeout can not be extended beyond SessionTimeout interval. [UNG-2024] - TUniTreeView: AbsoluteIndex bug. [UNG-2025] - RefreshCurrentRow doesn't work when DataSet.RecordCount returns 0. [UNG-2027] - Issue with TActionList in Service/ISAPI mode. [UNG-2030] - UniDBGrid: OnCellClick event is not fired if a CheckBox editor is directly clicked. [UNG-2031] - UniDBGrid: Incorrect selection list in CellClick event. [UNG-2032] - UniDBGrid: Null value is ignored for date field in a row editor. [UNG-2041] - UniDBGrid: Column move index bug. [UNG-2048] - TUniContainer client height issue when menu is attached. [UNG-2054] - TUniFrame.ClientEvents not implemented correctly. [UNG-2057] - TUniListBox: Bug when Selected Item is deleted. [UNG-2064] - In grid date editor fails to show after columns are reconfigured. [UNG-2069] - UniDBGrid: Focus is lost when tabbing through grid editors. [UNG-2073] - TUniDBVerticalGrid and TUniDBVerticalTreeGrid : Fields column is not shown when record count is zero. [UNG-2074] - TUniDBVerticalGrid and TUniDBVerticalTreeGrid : Grid doesn't start from current db row. [UNG-2075] - Service app freezes on stop. [UNG-2076] - In DLL mode variable ARequestInfo.CommandType returns hcUnknown. [UNG-2081] - TUniDBVerticalTreeGrid : Fields column can not be ordered according DBColumns order. [UNG-2082] - TUniDBVerticalGrid: Grid data is loaded twice. [UNG-2084] - UniDBGrid: Issue when RowEditor is active and row has a checkbox column. [UNG-2086] - TUniDBVerticalTreeGrid: Fields order issue. [UNG-2087] - TUniMenuItem does not execute ActionLink when an Action is associated. [UNG-2088] - Issue when CheckColumn field is in a DBTreeGrid. [UNG-2089] - SSL files can not be loaded in Windows Service project. [UNG-2090] - UniDBGrid: Value is not shown when OnGetText returns a non-numeric value for a numeric field. [UNG-2091] - UniDBGrid: CheckBox column issue with row select. [UNG-2092] - UniDBGrid: Various issues with CheckBox columns. 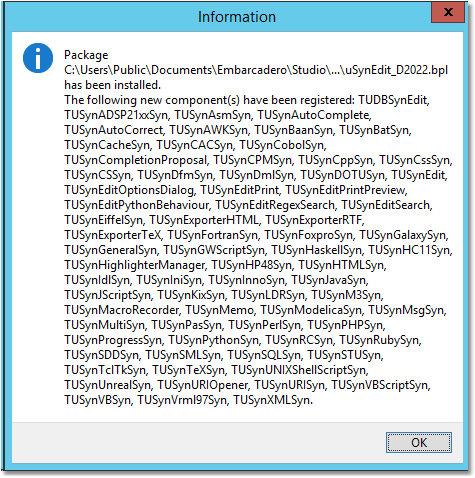 [UNG-2097] - Various persistent classes do not implement AssignTo(). [UNG-2098] - OnChange event doesn't encode values. [UNG-2099] - UniDBGrid: View does not scroll to focused row. uniGUI Release Candidate is here! We are happy to announce that uniGUI has switch from beta to RC stage. Finally, we have a Release Candidate for uniGUI! The new RC build is available for all editions including uniGUI Trial edition. It contains many bug fixes, new features and improvements. [UNG-1969] - TUniFormattedNumberEdit: Abbility to set FormattedInput parameters at runtime. We are happy to announce that a new build for Trial Edition of uniGUI is available. It contains many bug fixes, new features and improvements. 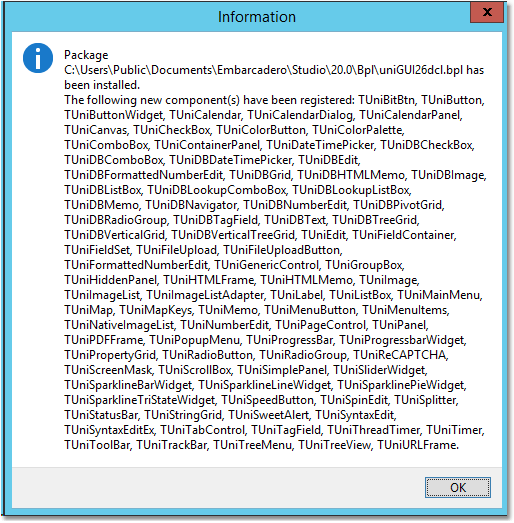 [UNG-1855] - TUnimDBListGrid: Column.Alignment implemented. [UNG-1871] - Hacking Preventation: Avoid processing events from controls that are disabled or hidden. [UNG-1887] - UniSession.Synchronize() method no longer needs Timer events to operate. [UNG-1898] - Session should create restart url based on HTTP Referer. [UNG-1912] - All Combo boxes: New RemoteQueryRetainResult property. [UNG-1917] - TUnimEdit: CharCase property implemented. [UNG-1846] - Now jQuery is included for mobile platform by default. [UNG-1853] - UniFileUpload: Execute method now is a function. [UNG-1879] - UniDBNavigator: New BeforeAction event. [UNG-1880] - Methods NewCacheFileUrl() & NewCacheFile(): "AvoidBrowserCache" parameter added. [UNG-1832] - UniContainerPanel contents are not clipped at borders. [UNG-1845] - TUnimHTMLFrame: Scripts are not executed. [UNG-1847] - UniPanel doesn't start as collapsed if Collapsed property is True. [UNG-1848] - Top most nested blocking uniForm can not be closed. [UNG-1859] - Editor ClearButton doesn't work in RTL mode. [UNG-1863] - MenuItem events are not removed when destroyed dynamically. [UNG-1868] - UniPageControl: TabBar is not set to Visible when a new Tab is added. [UNG-1870] - TUniGroupBox: Client area is not positioned correctly. [UNG-1874] - Issues related to AlwaysOnTop and menus. [UNG-1875] - Issues related to AlwaysOnTop and MessageBox. 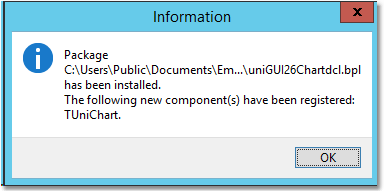 [UNG-1878] - uniUrlFrame : Console error "Uncaught ReferenceError : iframe_loadUniUrl"
[UNG-1883] - TabSheet is not closable. [UNG-1892] - UniEdit.InputMask is not filtered correctly when text contains mask characters. [UNG-1894] - In DBGrid # sign in DisplayFormat is ignored. [UNG-1904] - TUniChart: chart data is not inited if prepared in Form.OnShow event. [UNG-1905] - Mobile Form Show method call order is wrong. [UNG-1906] - Issue when a Mobile form containing TabPanel is closed. [UNG-1913] - UniDBLookupCombo: Issue with custom queries when RemoteQuery is enabled. [UNG-1916] - Missing ";" in CSS code of uniGUI visual themes. [UNG-1919] - In mobile Firefox browser phone platform is not recognized. [UNG-1920] - Putting a UniListBox on a disabled Panel throws a JS error. [UNG-1928] - UniDBNumberEdit error when field has a DisplayFormat. [UNG-1929] - DBLookup controls sometimes doesn't fetch all records. We are happy to announce that a new version for Trial Edition of uniGUI is available. This new version contains an exciting new feature which enables modal forms and windows to be shown in a true modal state. It means that modal forms will execute code execution until user closes the modal form. This will simplifies code migration between legacy VCL apps to uniGUI web apps. We have updated trial edition to the most recent version. This update will fix an issue which prevented trial editions from creating new ISAPI DLL applications. This build fixes this issue, so you will be able to evaluate ISAPI DLL in uniGUI Trial Edition. As always trial edition can be downloaded from our download page. Creating a new uniGUI project is as easy as creating a Delphi VCL Forms project. uniGUI Demos are installed under folder [commondocs]\fmsoft\unigui\demos. All demo projects are deployed in two versions: One for D2006/D2007 and another for D2009/D2010. Open one of the demos, SimpleDemo for instance, in your Delphi IDE and compile the project. After running the project, like any standard VCL forms project a regular Delphi form will appear inside your Windows desktop. Demo project contains a mini Web Server which tries to bind to a TCP port, so if your Windows firewall is enabled it will request you to grant access by unblocking it. If your system is protected with a 3rd party firewall be sure to assign proper permissions, so Web server can access TCP/IP layer. In some recent Windows versions ( Vista and Win 7 ) localhost may be directed by dns resolver to an IPv6 address which currently is not supported by uniGUI. You should be able to see application main Form inside your browser window which indicates you could successfully run the demo. You can load another demo and repeat above steps. To run SQL Demo you need to install DBISAM from Elevate Software. A trial version of DBISAM can be downloaded from here. • Before installing a new version remove all design packages from Delphi and uninstall uniGUI from Windows Program Add/Remove. • After re-compiling an application with this new version, "ext" folder must be re-deployed to PCs running new version of your application or you can simply re-install the newly introduced Ext JS runtime package which can be downloaded from Downloads page. **Note for C++ Builder: You need RAD Studio IDE to install uniGUI for C++ Builder. 1) Download the latest uniGUI Setup from download section. 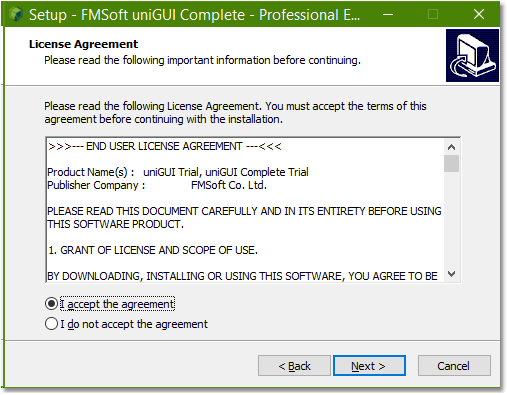 2) Accept the license agreement by pressing next. 4) Select an installation folder. 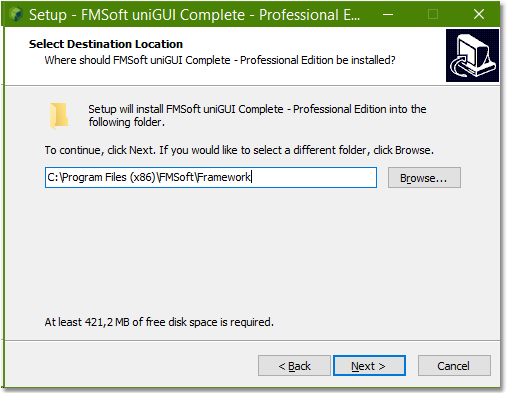 Default installation folder is [ProgramFiles]\Fmsoft\Framework\. 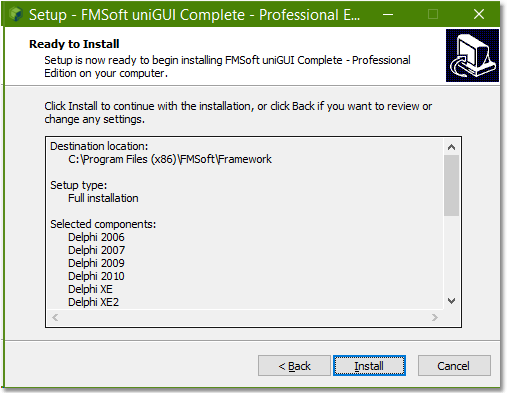 5) Select Delphi version(s) you want to install uniGUI library. You must be sure that Delphi is not running while installation is in progress. Current version of installer will not warn you about this. 6) Press Install to start and complete the installation process. 7) Start Delphi and open the project group for your Delphi version. e.g. uniGUI2016Group (Delphi XE6). **Additional step for C++ Builder: Instead of Delphi IDE open project in RAD Studio IDE. 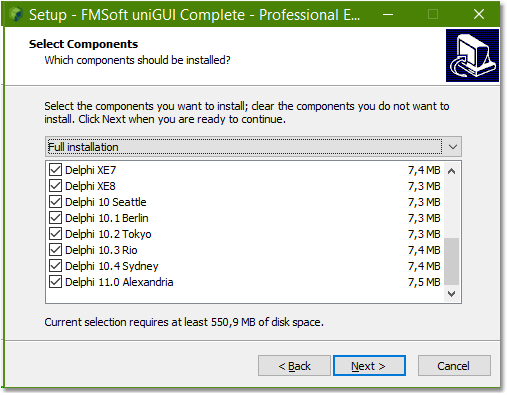 8) In project manager there are 11 Delphi packages. Build all packages starting from SynEdit_Rxxxx.bpl. **Additional step for C++ Builder: Before building packages, for each individual package please go to Options->Linker and Select/Set Generate all C++Builder Files. • After starting a new C++ project you must disable Linker->Dynamic RTL. • New C++ projects are created without a resource (.RES) file. As a result project has no default Icon. This issue will be fixed in next releases. • Combo VCL/ISAPI projects are not supported for C++ Builder.